Apple is reportedly increasing production of its upcoming 10.5-inch iPad Pro form factor ahead of the company’s Worldwide Developers Conference 2017 in June, according to a new report out of the supply chain. According to a new story from DigiTimes, Apple partners have further ramped up production of the new 10.5-inch iPad Pro. Monthly shipments are set to go up from 500,000 units currently to 600,000 units by July. Market watchers expect the annual shipment to surpass five million units this year. The increase in production generally indicates that its launch is imminent. In Apple’s most recent fiscal year – that is, fiscal year 2016 – Apple shipped 45.59 million iPads, down approximately 17% from the nearly 55 million that the company shipped in the year prior. Now, it’s worth noting that the above figures represent shipments for a fiscal year, whereas the 5 million to 6 million figure DigiTimes mentioned refers to shipments of new iPad Pros from June through December of calendar year 2017. The new tablet is rumoured to feature an edge to edge display. 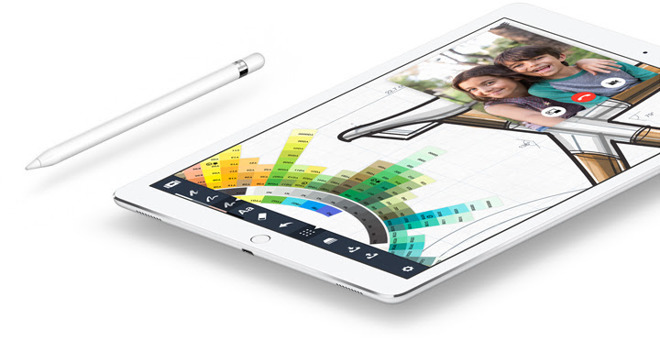 It’ll mark a new start for Apple’s displays, just like the 9.7 inch iPad Pro did with the DCI-P3 gamut. As for the upgraded 12.5 inch iPad Pro, the supply chain expects a late debut for the device, possibly around November.